By: Naomi, 4th Grade On January twelfth, Dilly (formerly of Hamor Hollow, now residing in Newton) went to school to visit my 4th grade class. The kids thought the fabulous Dilly was a dreadful and ugly Porcupine! The porcupine rumor was giving the wonderful Dilly a bad reputation and that made him hissing mad! Spiky mad! It made him so mad he rolled up into a ball and would not come out of the ball until the next day! 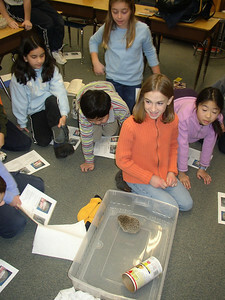 So Dilly came to the classroom to teach all of my classmates the difference between sweet and adorable hedgehogs and fat and smelly porcupines. First, he showed them they could pet him without hurting their hands and then he showed he was not as big as Godzilla (like a porcupine) and then he ate a meal worm and all the boys (plus me) went oooooooo and all the girls (not including me) went eeewwwww. 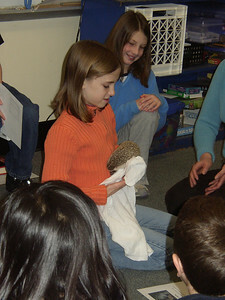 Dilly was so cute that everyone thought that they too wanted a hedgehog for a pet. Then Dilly ran up my pants leg because everybody was yelling and because he was tired. So then we decided that he wanted to go home because he was tired, but maybe he'll come back someday. When I got home from school I congratulated him for being such a good sport.